NEW YORK, New York, July 10, 2012 – The AIA New York Chapter’s Emerging New York Architects Committee (ENYA), is proud to announce the opening on Thursday, July 12, of its fifth biennial international ideas competition exhibition The Harlem Edge | Cultivating Connections. The exhibition showcases winners and selected entrants of the 2012 ENYA Biennial Design Ideas Competition, which aims to widen the scope of architectural discourse through challenging New York City-based design problems. “As architects and designers, we help determine the built environment around us by responding thoughtfully to the challenges we face,” said Joseph Aliotta, AIA, LEED AP, BD+C, 2012 AIA New York Chapter President. “The Harlem Edge competition and exhibition models those challenges for emerging professionals and advances the assertion that design matters.” The Harlem Edge | Cultivating Connections is presented as part of Future Now, the 2012 AIA New York Chapter Presidential Theme. Following previous waterfront sites that included Groen Hoek, Southpoint on Roosevelt Island, the South Street Seaport, and the High Bridge Crossing of the Harlem River, the 2012 competition focuses on the redevelopment of the West 135th Street marine transfer station, which establishes a link from the Hudson River to the West Harlem community. Out of 98 entries from 16 countries, 4 prize winners, 5 honorable mentions, and 14 additional juror selections will be shown at the Center for Architecture and published in a competition catalog. Schematic models and a commissioned video about the competition, site, and community round out the “waterfront lounge” installed in the HLW Gallery. The ENYA Prize – the competition’s highest honor – was awarded to “Sym’bio’pia” by Ting Chin, AIA, NCARB, LEED BD+C, and Yan Wang, AIA, LEED BD+C, of Linearscape Architecture, New York, NY. ENYA will also host a symposium at the Center for Architecture on 7/14 to highlight the winning entries’ designs and possibilities for the site’s and neighborhood’s future development. Emerging professionals with less than ten years of experience, including university level students, had the opportunity to creatively consider the possibilities for a multi-modal transit hub and a food and nutrition education facility. The competition’s client is Nourishing USA, a New York City-based not-for-profit 501 (c)(3) organization that strives to achieve “nutrition for all.” The site was chosen because of its opportunity to engage the local Harlem community with the waterfront, as well as its resonance with recent efforts by New York City to reclaim its waterfront for non-industrial use. Opened in 1954, DSNY’s West 135th Street marine transfer station processed a daily average of 1,000 tons of waste. The station was permanently decommissioned in 2001 because of health concerns over local air quality. The abandoned E-shaped steel building and four timber piers have subsequently deteriorated; the building is currently deemed unsafe for occupancy. The Harlem Edge, along with the Department of City Planning’s “Vision 2020: A Comprehensive Waterfront Action Plan for New York City,” seeks to increase public access to the city’s waterfront through smart design interventions. Working with Nourishing USA as a programmatic sponsor, the competition brief included both interior and outdoor spaces to anticipate programmatic developments in a growing urban agriculture movement, along with the requirements to physically connect to the adjacent residential community. Entrants were challenged to re-imagine the presently inactive site in light of four criteria: public access to the city waterfront; means by which urban agriculture can be introduced into the community; creative programming and its ability to stimulate economic activity; and sustainability. The distinguished panel of jurors, who selected the competition’s winners from 98 entries on February 22, 2012, were: Emily Abruzzo, AIA, LEED AP, Partner, Abruzzo Bodziak Architects LLC, and a winner of 2012 New Practices New York; Meta Brunzema, LEED AP, Principal, Meta Brunzema Architect PC; Dr. Dickson D. Despommier, PhD, Emeritus Professor of Public Health, Environmental Health Sciences, Columbia University; Louise Harpman, Assoc. AIA, Clinical Associate Professor, Architecture, Urban Design, Sustainability, NYU Gallatin School of Individualized Study; Michael Marrella, AICP, Director of Waterfront and Open Space Planning, New York City Department of City Planning; Jesse Reiser, AIA, F.A.A.R, Principal, Reiser + Umemoto RUR Architecture PC; and Keith VanDerSys, Principal, PEG office of landscape + architecture, and winner of the 2010 ENYA Prize. The Harlem Edge | Cultivating Connections showcases jury-selected responses to a complex design brief, which charged entrants to explore the redevelopment of the decommissioned New York City Department of Sanitation (DSNY) marine waste transfer station located in the Hudson River at West 135th Street. Projects are shown though images and text. 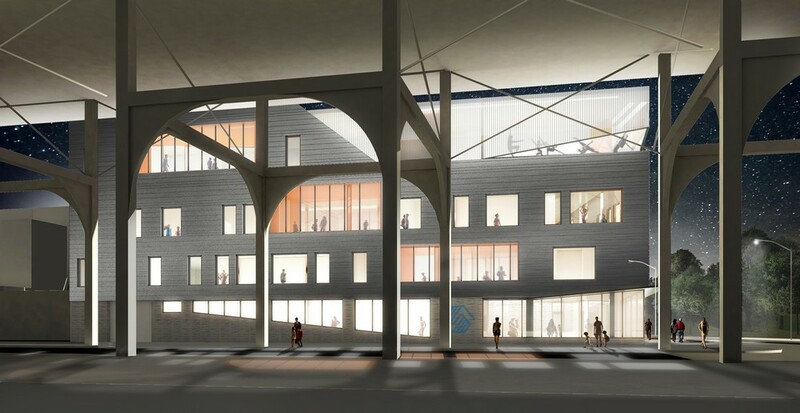 In addition, through the generous support of President Aliotta’s Future Now fund, the four top prize winners are represented by models and a “waterfront lounge” installed in the Center’s HLW Gallery. The lounge features an in-depth collection of books on waterfronts and a commissioned video that provide context for the competition, its chosen site, and the West Harlem neighborhood to which the site is linked. Also included is a section on “studioENYA,” a partnership between the Center for Architecture Foundation and ENYA. In September 2011, studioENYA opened the Harlem Edge competition as a design exercise to students from the High School of Art and Design, the Brooklyn Technical High School, the Urban Assembly School of Design and Construction, and the City College High School of Math, Science and Engineering. The most promising schemes selected by a joint ENYA-Center for Architecture Foundation jury will be on display. Finally, a partnership with the ACE (Architecture, Construction, Engineering) Mentor program provided three mentoring teams with the competition brief. Working within the mentoring groups supported by Swanke Hayden Connell Architects, Gensler, and Dattner Architects, 45 students were able to participate in the design competition. Images and text documenting this partnership are included in the exhibit. While AIA New York, with close to 5,000 members, is the oldest and largest chapter of an 80,000 member national organization, its commitment to support and promote young and emerging talent is expressed through this fifth iteration of the ENYA Biennial Design Ideas Competition. The Harlem Edge | Cultivating Connections exhibition presents superlative entries to the latest design ideas competition developed by the Emerging New York Architects Committee (ENYA). Following previous waterfront sites that included Groen Hoek, Southpoint on Roosevelt Island, the South Street Seaport, and the High Bridge Crossing of the Harlem River, the 2012 competition focuses on the redevelopment of the West 135th Street marine transfer station, which establishes a link from the water to the surrounding community. Exhibition design by Manuel Miranda. The exhibition opening for The Harlem Edge will be held Thursday, July 12, from 7-9pm at the Center for Architecture, 536 LaGuardia Place, New York City. Free and open to the public. The afternoon will include presentations by winning and selected competition entrants, Nourishing USA (the competition’s client), ENYA Competition Committee members, representatives from the Harlem community, The Harlem Edge jurors, and other distinguished professionals involved in waterfront development. The Harlem Edge | Cultivating Connections is organized by the Emerging New York Architects Committee (ENYA) and presented as part of Future Now, the 2012 AIA New York Presidential Theme.